Bishop Peter Elliott is a Catholic bishop in the Archdiocese of Melbourne where he is Titular Bishop of Manaccenser. Yi Wang asked Bishop Elliott if he could sit for him, as he wanted to paint a religious man of grace. ‘Bishop Elliott has great facial features for a portrait and I was also attracted by the idea that a Catholic Bishop would have garments that would provide great colours,’ says Wang. ‘Before meeting the Bishop, I envisaged that he would be more of a serious and stern figure and that I would capture him in a serious pose. I had all this planned in my head before I got to his Ormond residence for the sitting. When we first got started, I had the Bishop in several formal poses but for some reason it just did not feel right. 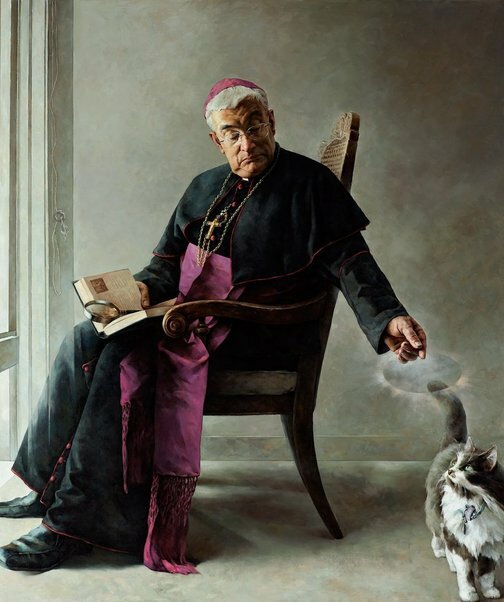 ‘Over lunch I got to have a much more relaxed conversation with Bishop Elliott and I got to see the much more humorous and witty side of him. That was my moment of enlightenment. I realised that what I really wanted to capture was a moment in the ordinary life of Peter Elliott, a ‘man’ who also happens to be a Bishop. Born in Tianjin, China in 1959, Wang has a Bachelor of Art degree from the Tianjin Academy of Fine Arts. He graduated in 1982 and between then and 2003 won multiple art awards in China. He moved to Sydney in 2006. In 2009 he was one of several Australian-Chinese artists represented in an exhibition in Beijing. He was a finalist in the 2008 Archibald Prize when his self-portrait won the People’s Choice Award in Bendigo.